Q: Your article doesn't say what you think made the towers fall so fast. What's your theory? A: This web site does not advance any theories, it disproves the government's theory, by pointing out inconsistencies and ruling out impossibilities. But it seems obvious that the reason the towers came down at nearly free-fall rates (~ 1g) is because they came down, near-totally unopposed by lower structure, under the influence of gravity (which was presumably in effect). 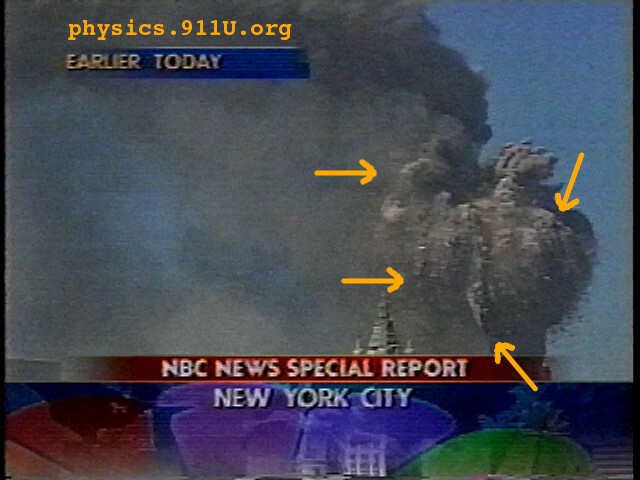 Combining that conclusion with what is seen in the videos (energetic explosions) indicates that supports for the lower floors were taken out, just in time, ahead of (to keep up with) the falls, in an illusive, very high-tech, extremely high-energy demolition-on-demand; an unnaturally-fast "collapse" which was clearly enabled (IOW, the path was cleared) by more than just forces due to gravity. In other words, the towers did not passively fail, they were actively failed, in real-time. 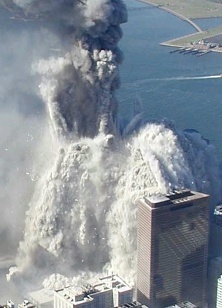 It also is clear that the falls of the towers cannot begin to account for the unique devastation or phenomenal aftermath effects at ""Ground Zero"". 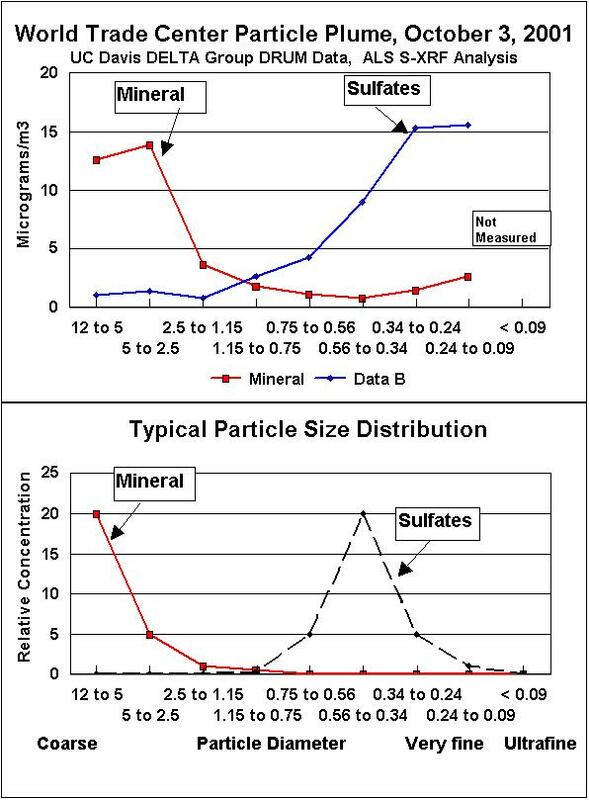 Further, since there is no known pulverization mechanism which can account for the scope, scale, or size distribution of all the unprecedentedly fine particles in all that still-unexplained dust, it would be preferable if people would stop talking and writing about "pulverization" as if everybody already knows what led to all that "dust" everywhere. We have recently become aware of a credible hypothesis for what might have caused the overly-rapid top-down razings of the twin towers. You can find it here. Q: Other 9/11 sites tend to focus on conservation of momentum, while your article focuses on conservation of energy. Since both are conserved, why do you only consider conservation of energy? A: Because momentum is only conserved in non-destructive collisions, and one look at the 'collapse' videos makes it obvious that destruction was occurring on a massive scale as the towers were annihilated top-to-bottom, making conservation of momentum analyses misleading, at best. A good reality check avoids unnecessary complications and does not make unnecessary assumptions. By looking at conservation of energy instead of conservation of momentum, no assumptions about the complex mechanics (forces, directions, solidity, deformations, etc.) involved in the 'collapses' are required. Besides, while momentum is mainly just a physics term to many people (who mistakenly see the towers as both overwhelmingly massive and incredibly frail due to their exterior proportions plus all the core-denying official propaganda), everyone who pays for energy knows that energy does not suddenly appear on cue in unprecedented intensity and abundance, unmetered, for no reason. Q: Your article did not state how long the fall of the South Tower should have taken. How long should it have taken? The question implies that the towers indeed should have fallen, when, in fact, they should not have! The question is indicative of "barking up the wrong tree" or "wrong-headed thinking", or "false argument" (fallacy). People often become ensnared in its false elements when they fall victim to The Big Lie. Example: It's as if you told me that you saw a magician cut a woman in half and put her back together again in 5 minutes, and I told you that it's impossible for anyone to saw a woman in half and put her back together unharmed in 5 minutes, and you asked me how long it should take. In the case of the WTC on 9/11, the too-rapid falls reveal another lie in the official explanation for the events of 9/11. The fraud of 9/11 cannot be explained away by a slight -- or even a 100% -- discrepancy in the reported duration, any more than it's possible to saw a woman in half and put her back together unharmed in 10, rather than 5, minutes. It misses the point to dwell on the precise amount of time it took to perform the feat of magic (where "magic" is defined as the apparent performance of that which, in reality, cannot actually be done), though that argument can be and has been used to distract from the (un)reality of the situation. Q: Your article uses the government's 10-second figure, but some other web site says it took a little (or much) longer. Doesn't that disprove your disproof? Why do you do that? A: Because this web site points out holes in the government's ludicrous official conspiracy theory of 9/11. Once everybody recognizes that we cannot believe most of what the government says about 9/11, and that the 9-11 Commission Report grossly misdescribes the true nature of the events of 9/11, and once We The People have used that awareness to reclaim the U.S. Constitution, then we can afford to sit around arguing about just precisely how impossible the original official theory of the collapses was. Besides, the article does not really "use" that number; it does not appear in any calculation. "10 seconds" represents a free-fall barely affected by air resistance. Since the South Tower's highly-destructive ( = highly energy-requiring and energy-consuming) fall was through a supposedly-undamaged lower structure which should have offered resistance thousands of times greater than air, a gravitational collapse would have taken much longer than 10 seconds. Yet it did not. So "10 seconds" is basically just a handy reference point for the reality check, though it does also confirm that the 9-11 Commissioners signed off on the fact that the S. Tower's lower structure did not offer appreciably more resistance to the fall than does air, and thus neither the Commissioners nor their report can be taken at face value: For the collapses to have been anywhere near 10 seconds is indicative of the fact that gravity could not have driven such rapid, incredibly destructive collapses, at least not without some incredible form of resistance-overcoming help. The provided video, and others, clearly reveals that the front of the so-called "collapse wave" advanced downward at nearly the same rate as the free-falling debris. That's the proof, right there! We shall not permit ourselves to become distracted and diverted from this obvious, government-lie-revealing truth by an argument over a second or two here or there, for to do so is to miss (or perhaps try to obscure) the point, by quibbling over an insignificant difference where there should have been a huge (parachute-like, if they 'collapsed' at all) difference. BTW, the government, in fraudulent support of its ludicrous "free-fall collapse" contention, does not attempt to dispute the time, so why are you? Q: But the government's own scientists, at NIST, the National Institute of Standards and Technology, insist with certainty that gravity pulled the upper portions of the towers downward, destructively, through undamaged floors below, at the rate of a free-fall! What do you say to that? A: LOL - Surprise, surprise; the government lies...! Since the stories below the level of collapse [sic] initiation provided little resistance to the tremendous energy released by the falling building mass, the building section above came down essentially in free fall, as seen in videos. As the stories below sequentially failed, the falling mass increased, further increasing the demand on the floors below, which were unable to arrest the moving mass. First of all, note that, just as in the false, faith-based 9-11 Commission's Omissive Report, NIST presumes that the impossibly-false "collapse" legend is true, and then pathologically seeks to support the unsupportable conclusion, by essentially slathering more and more lipstick on a pig, and piling its pseudo-scientific BS higher and higher. In a nutshell, NIST declared that since "everybody knew" that the towers had suffered "gravitational collapses", and since the towers were deverticalized in what amounts to free-fall times, that that must mean that the supposedly-undamaged lower stories provided zero resistance to the "fall". So NIST maintains that the path of maximum resistance provided essentially zero resistance! Think about that: those lower stories had supported the upper portions of the towers for 30 years! Water provides so much resistance that nothing can fall through it at the rate of a "free fall", and water could not have supported the upper portion of the tower for even 1 second! How can solids provide less resistance than water? Answer: they cannot! Consider: "free fall" means "free to fall"! In other words, nothing in the way to impede the fall. Not even, in the case of a parachute, air! Supposedly-undamaged lower stories which had supported upper stories for 30 years would certainly have impeded any actual fall. But wait, there's more: note that NIST's false claim also includes "As the stories below sequentially failed, the falling mass increased". But IF that were true, then each time the "falling mass increased", 'it' [sic] would have accumulated mass that was stationary, thus decreasing the average/overall velocity of the supposedly accumulated falling mass. So NIST's explanation is self-disproving, by conservation of momentum, which is why it is probably a bad idea to spend any time visualizing an accumulating falling mass -- or billiard balls -- when that is so totally inapplicable to the reality of what occurred, and thus is so misleading even to imagine (but if you think you can visualize a "building section above" falling at free-fall rates while accumulating staionary stories on its underside "all the way down", try to remember to ask yourself what happened to the roof, and to the falling stacked stories; where did they go, and when, and how? And what about the huge continuous vertical support columns??). Remember: often, when the experts are wrong, they are not mistaken; they are lying. They are intellectual prostitutes. Q: I can't find anything wrong with your physics, or your logic, but I still just could never believe that our government and our media and basically all our institutions would ever deceive us about something like this. So I'm sticking with the explanation for 9/11 with which I'm already comfortable and familiar: the government's! What do you say to that? A: That is a very common, normal response - so normal that a very famous historical figure knew that that's how you would react. Everyone's entitled to their own opinion, but not their own set of facts. Logically, once we rule out the impossible, whatever remains - no matter how improbable - must contain the truth. Even if you insist upon blaming the falls of the twin towers on the damages resulting from "airplane" collisions, just remember that the demise of WTC7 also similarly fails the near-free-fall-time conservation-of-energy reality check, and not even the government claims that it was hit by any self-propelled flying objects. Please also remember that never before in history has any high-rise steel building ever collapsed as the result of fires. And no collapse, or even explosions and bombings, had ever produced so much very special dust. So, clearly, on many levels, something very much out of the ordinary occurred at ""Ground Zero"" on 9/11. Just as the old flat-earth theories could not account for eclipses, the Official Government Conspiracy Theory of 9/11 can not account for the rapidity of the 'falls' of the skyscrapers, nor for the sudden appearance of the incredible amount of "free energy" which accompanied the 'falls', nor for the unprecedented production of so much 'dust' (containing so many nanoparticles). Just because the government and media have provided (propagandized) us with an incredible explanation for an incredible series of events does not mean that it must necessarily be true, particularly when it has been proven false, because it is clearly impossible, and also happens to be brazenly inadequate to account for the unexplained and still widely unknown symmetrical vertical resistanceless fall of WTC building 7 (we're expected to believe that all its massive support columns completely failed, simulatneously, by chance? ), a nearby 47-story skyscraper, later that same day. You needn't adopt any other speculative explanation or scientific theory (or conspiracy theory) before you allow yourself to see through, and reject, the government's impossible claims of 9/11. ...even high explosives could not do this! Download: MP4 video shows separate violent outbursts of intense energy and disintegration! As best we can tell, there are four main kinds of people who still don't get it: Those who've never really thought about it, those who are more than a bit physics-challenged and still do not understand that the energy required to so thoroughly destroy the towers should have subtracted significantly from what gravity's acceleration had to give, those whose minds are warped and whose thinking is permanently flat-earthed by all the shock and awe and immersive propaganda and widespread social acceptance of the huge psy-op, and those who are outspoken outright government disinformation agents, who would have you believe that if we just changed the observed, recorded, and admitted-to 10 second South Tower collapse duration to 15 seconds, or maybe somehow stretched it to 17, everything would be OK, and we all could go on believing the government's ludicrous impossible "pancake collapse theory" explanation, upon which a large portion of its conspiracy theory of 9/11 is based. Perhaps, if you're still trying to decide if this really is a no-brainer or matter of opinion to which everyone is entitled, it is only because of the absurdity of the whole question -- how can we relate, never mind equate, air resistance to steel resistance? -- in the first place. Fortunately, our old friend Galileo showed us how to bridge that gap. See, Galileo didn't have modern timing devices available to him. In order to get gravity to reveal its secrets to him, Galileo slowed it down, by permitting rolling objects to "fall" along an inclined plane. By letting things thus fall at an angle to vertical, gravity's effect became easier to observe, and the concept easier to grasp. Galileo was relying upon a continuity in how gravity's vertical effect varied at varying angles to vertical, and that any increase or decrease in gravity's effect with change of angle would be continuous and thus a representative progression (of compromises) between all (vertical) and none (horizontal). So let's do a little thought experiment and consider a compromise in resistance between air (a gas) and steel and concrete (rather hard solids). Let's consider water (a liquid), and think about how much energy-sapping impedance to motion it offers. Because, like air, water is fluid, which means it can be rearranged without requiring (consuming!) vast amounts of energy breaking molecular bonds, which is, after all, what makes a solid solid. There are a few obvious ways to do this. Just ask yourself, how fast can you walk through water? Another is, if you have the space available right now, to stand up and swing your arms quickly so that they meet in front of you and behind your back. See how fast you can do this. Feel the breeze between your fingers, and then try to imagine doing it that fast through water. Obviously you could not do it as fast in water as in air. Now consider doing it through styrofoam or foam rubber, or through ice, or through concrete or steel. Or think about how a bullet fired from a gun will go a long way through air, but how it is seriously deformed and stopped or at least significantly slowed as soon as it hits something, including water. Remember when I asked you to imagine putting your arm out the window of a car moving at 100 mph? Obviously you can't imagine putting your arm out the window of a car going through steel at 100 mph, but what about putting your arm out the window of a car going through water at 100 mph? OK, how about half that fast? OK, how about a quarter that fast, then? Remember, water is not anywhere near as hard as are steel and concrete buildings, nor does water require nearly as much energy to rearrange. Another way is to imagine dropping a bowling ball from the height of the WTC. We know it would hit the ground in 9.2 seconds in a vacuum. And that it would take over 10 seconds through air. But how long would it take through water? 30 seconds? A minute? Surely more than 17 seconds! And how long would it take through styrofoam? Or rubber? Or wood? Or ice? Or concrete and steel? As you can probably visualize, fudging the numbers by a handful of seconds does not come even close to allowing a fall as rapid as was observed to have occurred non-destructively through WATER, let alone a hugely destructive collapse through supposedly-undamaged structurally-sound lower floors below the original damage. Gravity simply is nowhere near powerful enough to satisfy the government explanation for what we observed. The extraordinary evidence left behind at aptly-named Ground Zero indicates that energies far in excess of what could have been provided by even a great amount of conventional explosives were involved in the destruction -- above and beyond the "collapses" -- of the WTC buildings. 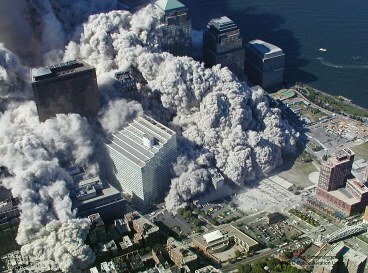 If you insist upon clinging to the notion that all the concrete and glass and other contents of the towers were merely "pulverized", you should consider that 1)there is no known viable "pulverization" mechanism which can account for such vast thorough destruction on such a grand and tiny scale so rapidly, and 2)even if there were, that would still, according to the official "pancake theory", have consumed a huge amount of gravity's potential energy (and then some! ), which, in a gravity-driven collapse, would have meant probably no fall at all, but certainly nothing more rapid than a fall at nowhere near free-fall speeds, which is just what a parachute can accomplish with only air to do work against. And as much as it pains us to say this, if you STILL don't get it, if you still cannot fathom the extent to which we have all been lied to by our own government, then you and your children might not deserve to get our stolen Constitution back. And if you don't get it back, that means we've all lost it, probably forever. Now that we know, with absolute certainty, that we cannot blame the "collapses" on "airplanes", this might be a good time to stop blaming 9/11 on "hijackers".